The Lab School of Washington is situated in the Palisades neighborhood of Washington, D.C. Located minutes from historic Georgetown, the Potomac waterfront, and a short drive to the museums, monuments, and other local historic sites, The Lab School spans two campuses, just a half-mile apart. An athletic center includes a pool and gym. The Lab School of Washington offers its faculty and staff the opportunity to work in a creative, collegial, and collaborative atmosphere. Each year, we have a few openings for experienced professionals. Take a look at The Lab School of Washington; we think you’ll agree: the difference is extraordinary. At Lab teachers and students are equal partners in learning. Personal experience and knowledge always create new learning. 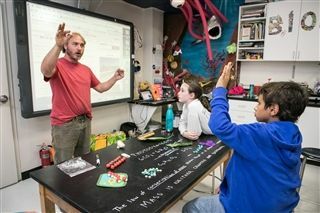 The Lab School seeks a full-time math teacher for the 2019-2020 school year. Courses may range from pre-algebra through trigonometry/pre-calculus. The ideal candidate would have an advanced degree and experience teaching high school students with learning differences. Solid organizational and writing skills, strong interpersonal skills, and the ability to work collaboratively with a strong faculty are sought after attributes. The candidate must hold certification in secondary math or be certification-eligible in the District of Columbia. The Lab School of Washington, an independent school in NW for children with learning differences, is seeking a full-time Theater Technical Director/ teacher. The Technical Director will supervise and facilitate all technical aspects of activities in the school’s newly constructed theater and will teach 2 technical theater classes to high school students. The candidate should possess a creative and collaborative spirit, a commitment to The Lab School of Washington’s mission of arts-based education, thrive in an environment of self-direction and multiple tasks, have a sense of humor, and have the ability and talent to build relationships with colleagues and students. A degree in Theatre Arts or Theatre Education preferred. The candidate must be competent in the areas of light, sound and scene design and enjoy working with young people. Candidates should forward cover letter, resume, and three references to shaun.miskell@labschool.org​. The Lab School of Washington, an independent school in NW for children with learning differences, is seeking a full-time co-teacher in the Elementary program for students in the 2nd-4th grades. A master's degree in Special Education is required and candidates must possess or be eligible for certification in the District of Columbia. The co-teacher will be responsible for shared planning and teaching in math, written language, and literacy, as well as the supervision and management of students. Candidate must have enthusiasm, creativity and an exceptional ability to collaboratively plan and implement lessons with a teaching team. Please email cover letter, resume, and three references to elementaryrecruiting@labschool.org. The Junior High Division is seeking a full-time School Social Worker with excellent clinical skills working with early adolescents and knowledge of the challenges faced by students with learning differences. Additionally, candidates should be experienced and comfortable working closely with both teachers and parents. Experience with and a preference for an interdisciplinary team model is desired. Primary tasks include: drop-in counseling of students; designing and teaching psychoeducational curricula; carrying small individual therapy caseload; consulting with staff; supporting the growth and success of existing school-wide social-emotional health initiatives; reviewing admissions files; presenting on mental health-related topics; and attending supervision and professional development trainings with the school’s Department of Psychological Services. Experience with Responsive Classroom, mindfulness practices, and social-emotional learning programs are a plus. MSW, LICSW preferred. 2+ years of clinical experience with youth preferred. Send cover letter, resume, and three references to jhrecruiting@labschool.org with ‘Junior High Social Worker Position’ in the subject line.